Before Reading State’s Exhibit J, Learn about the woman who gave it, Minola McKnight. 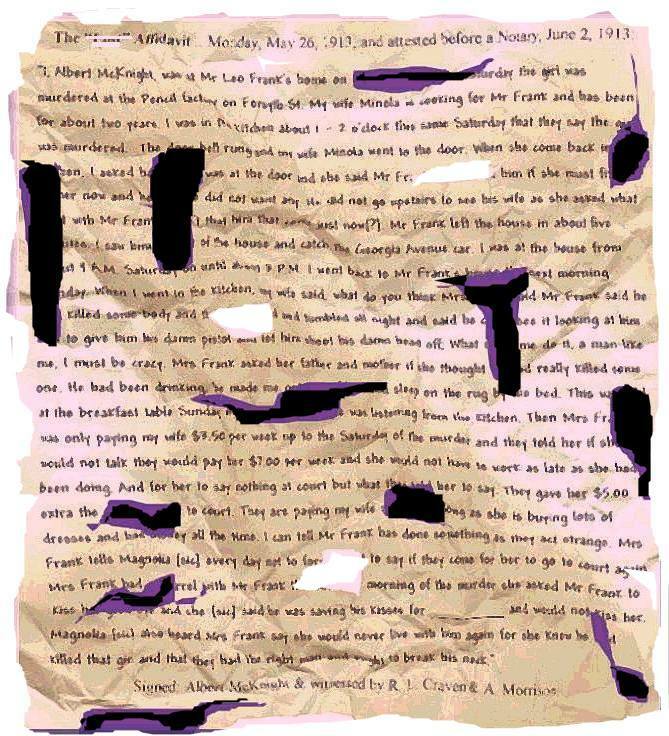 STATE’S EXHIBIT J, Leo Frank Trial Brief of Evidence, 1913. State of Georgia, County of Fulton. eight o’clock, and Albert [McKnight], my husband, was there Saturday, too. [1:40 PM] after he [Mr. Leo Frank] got there. past eight [8:30 AM] and I found out that Mr. [Leo] Frank was gone. after dinner when they said it; I understood them to say it was a Jew girl. and she said she slept on the floor on the rug by the bed because Mr. [Leo] Frank was drinking. Sworn to and subscribed before me, this 3d day of June, 1913. (Signed) G. C. FEBRUARY, Notary public, Fulton County, Ga.
Leo Frank’s defenders, then and now, have long claim Minola was tortured or coerced to produce State’s Exhibit J. But Concerning the veracity of State’s Exhibit J, one should consider State’s Exhibit B, and why Leo Frank so thoughtfully bought Lucille Selig Frank a box of Chocolates at Jacobs Pharmacy on Saturday, April 26, 1913, at 6:15 pm, just minutes before catching the 6:20pm trolly home, to his in-laws residence at 68 East Georgia Avenue, Atlanta. Leo Frank claimed he arrived at home at 6:30pm. 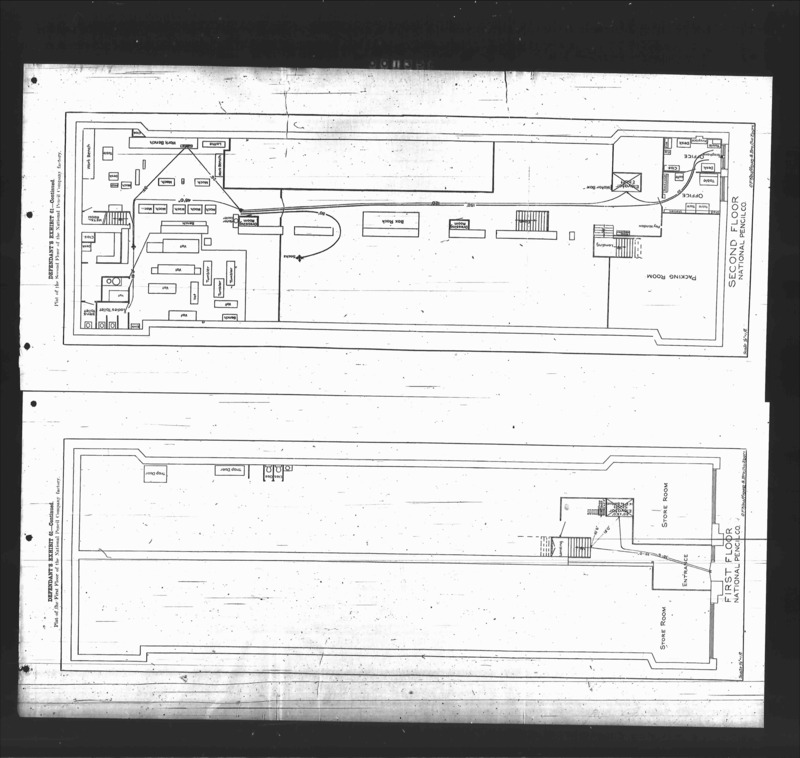 Image: Defendants Exhibit 61, Ground Floor and Second Floor 2D Birds Eye View Maps of the National Pencil Company: http://www.leofrank.org/images/georgia-supreme-court-case-files/2/0125.jpg. Plat of the First and Second Floor of the National Pencil Company. Defendants Exhibit 61. Leo Frank Murder Confession #2, see Lucille Selig Frank and Minola McKnight (State’s Exhibit J, June 3rd, 1913). If you want to ask one of the worlds foremost Leo M. Frank scholar questions about the Leo Max Frank case, contact Allen Koenigsberg. Post your public questions: http://groups.yahoo.com/group/LeoFrankCase/. The Leo Frank Case Library and Archive (www.LeoFrank.org) is not affiliated with Allen Koenigsberg and the Leo Frank Yahoo Discussion Group. Last Updated: June 3, 2013, the centennial of State’s Exhibit J.